When the very first Elite game was released, I was still two years away from being born. Despite missing one of the founding fathers of the space simulation genre, I found myself enjoying countless hours in titles such as X-Wing and FreeSpace. This love affair wasn’t to last though, because the further away the games industry got from the fruitful period of the late nineties, the more the space simulation genre fell out of favour with gamers who were enamoured with first-person shooters. Developers were still keen to produce games that recreated every boy’s dream of acting out Han Solo-style escapades but publishers just weren’t willing to take a chance on anything less than a sure thing. Thankfully, those times are over. 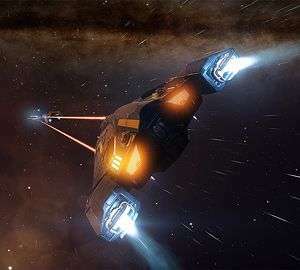 Elite:Dangerous is a trading and combat simulator set in space, and the latest instalment in the Elite series. 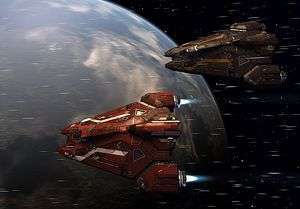 Players find themselves in the familiar position of being given a basic ship, a small number of credits, and the freedom to do whatever they want, in order to further their own careers and lifestyles. Whether you want to be an honourable tradesperson or a cut-throat pirate, Elite will accommodate the direction in which you want to take your life. You will exist inside a world modelled on our universe, and it is huge. 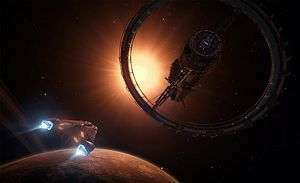 There are four hundred billion stars and one hundred billion star systems within the game for players to explore, including planets, moons, stars, and asteroid fields. The interactive map used to read and navigate the universe is very slick and futuristic, looking like a blend between the map designs of Mass Effect and Minority Report. This map is ridiculously detailed, allowing players to look at any point in the universe and gather information on it. There were plenty of details on places such as Earth and The Moon; going deeper into the unknown, however, just raises question marks and it will be up to the player to make it to these outer reaches and discover a new frontier, should they choose to do so of course. In order to access these unknown areas, players will need to earn credits to purchase better ships, weapons and equipment if you want any chance to survive. There isn’t any class to pick or levels to earn – a move I find interesting and much more realistic than having to pick a ‘life’ and focus on ‘levelling’. Here in the world of Elite you simply pick an area to focus on and earn credits for doing so, whether that be aiding rebels, acting as a spy, signing up for military service, or just exploring the expanse. Whatever you end up doing, your ship will need to be fit for purpose and Elite certainly does not have any shortage on ships. Players will have twenty-five different playable crafts at launch, and during the preview we spent most of our time in the Eagle MK.II, a cheeky little fighter ship that had room for one pilot. Some will be modelled on older designs and Frontier Developments are keen to merely modernise and not change the old guard. Looking around the cockpit of the Eagle, I felt a sense of childhood glee re-awaken inside the pit of stomach that been suppressed by years of gaming crud and disappointment. Everything in here was as I remembered from the majority of space simulator games, except it now looked and felt real. To the left of my immediate display was information about any ships I was targeting, and to my right a fully three dimensional map that would aid in me in dog fighting. If I turned the view to my full left or right, small holographic displays actually popped up and displayed swaths of information for me to flick through; it was as incredibly impressive as it was fluid. Prior to take-off we were briefly shown the customisation area for our ship and it looked pretty extensive. Different ships have a plethora of changeable options dependent on their class and what you want from them. Nothing more was shown of this but there were options to change weapons, cargo holds, and such like. Leaving the space station we docked at required more than a couple of button presses and jamming the thrusters forward. We had to undock from the landing bay, gently raise our ship from the pad, and make for the small port at the end of the landing bay, while raising the landing struts and ensuring we didn’t crash into the side of the station. Upon exiting we were free to go wherever we wanted and it was then that we were shown the two main methods of travel. Getting around a universe this huge will always be a slow process if you were trundling along at a couple of hundred miles per hour, like some prehistoric jet fighter. 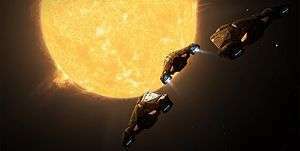 Instead, Elite:Dangerous has two methods of faster than light travel: Super Cruise and Hyperspace. Super Cruise is used for travel within star systems, and the maximum speed will depend on your proximity to large areas of mass. While you have the ability to move around and steer in Super Cruise, when you encounter larger objects your ship will automatically begin to slow down so you don’t end your jump inside a star. This is a good method of travel if you wish to move quickly within a star system. Hyperspace is the opposite of Super Cruise, in as much as you can use it to travel between star systems rather than within them. Using Hyperspace requires you to select the location you wish to jump to and then line up your target using your cockpit map, so escaping from immanent death isn’t as simple as hitting a button and living to fight another day. Interestingly, Hyperdrives all have different ranges, charge up times, and fuel consumption based on their model and you can also follow other players’ Hyperspace trails. In a demonstration of the Super Cruise mode, we shot off to Saturn to show off some of the incredible graphical detail on offer. Arriving there took all of ten seconds from our starting location and I pulled back on the throttle to bring the planet into view. On instruction I took the ship closer to the rings that circle the planet, only to watch as they slowly transformed into individual asteroids right before my eyes. Before I knew it I was flying in between floating chunks of rock dodging tiny fragments I was blasting off with my lasers, watching as little puffs and plumes of dust erupted from my gunfire – it truly was a sight to behold. All of these details, all of this seamless interaction, and the frankly gorgeous graphical detail meant I was becoming an Elite convert in record time, but what about the combat? I was eager to see how dog-fighting was handled in this arena. Soon a typical combat scenario was thrown our way – a Corvette-class ship had come under attack by a group of enemy fighters. They turned out to be pirates and were interested in destroying the fighter ships that had been deployed to aid the Corvette as it chucked out a decent amount of damage itself. Quickly, our view changed to the side computer to designate our allegiance and on this occasion we sided with the pirates. Entering into a dog-fight couldn’t have been simpler and was a case of selecting a target on the computer and engaging them. The Eagle MK.II moved exquisitely around the Corvette, chasing after enemy ships and gunning them down with my battery of lasers. This tiny battle was a mere ripple in an ocean the size of which I couldn’t really comprehend, and yet I felt like my actions were tipping the balance of power in a very real way. Not being concerned about levels, class, or experience points felt refreshing and gave me a new sense of freedom; I was here for the money – pure and simple. That is, if things had gone according to plan. Without realising it, I’d entered into a fight that mimicked the Kobayashi Maru, the demo being tweaked so that I couldn’t possibly win. Soon the number of pirates dwindled and I was the only one fighting the Corvette and an increasingly large group of fighters. Damage sensors and warning signs started bleeding into view, and a sense of panic set in – something Frontier Developments should be very proud of. A crack appeared in the cockpit, atmosphere started venting into space, my HUD went dark as the power dropped, and without a word of warning I collided with an enemy fighter. Someone once said that in space no-one can hear you scream. Inside my head however, there was a party going on. This was what I’d been after for so many years of wishing that the space simulation genre would return with all guns blazing. Everything about it felt right but more importantly, it felt like it had been crafted by people that understood and loved this genre for the same reasons that I did. I know that there are a few games of this type on the horizon but if they’re anything less than the standard Elite: Dangerous is setting, they shouldn’t bother showing up. I went to YouTube and found so many gorgeous videos of people playing this – it is unbelievably awesome looking. For a game in beta, it looks like a finished article.